The foods seniors choose to eat can have a significant impact on their health and other aspects of their lives. Beans have proven to be a nutritious and convenient choice, making them the perfect option for people over 65. Harrisburg, PA, senior home care professionals discuss 5 reasons your senior loved one may want to add more beans to his or her diet. 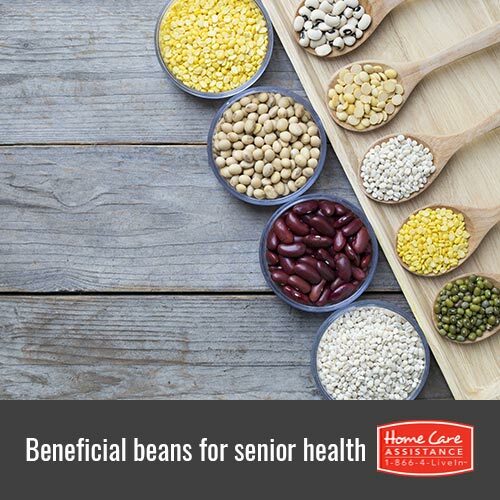 Beans are high in many nutrients that are vital to a senior’s health. Because caloric needs decrease with age and seniors tend to eat less, it’s important for them to eat plenty of nutrient-dense foods. Beans contain antioxidants, fiber, protein, B vitamins, iron, magnesium, potassium, copper, and zinc. Half a cup of beans only contains 100 calories, which means they should be easy to incorporate into your loved one’s diet. Eating beans several times a week can lower your loved one’s risk of contracting colorectal cancer and coronary heart disease. Because the chance of developing these diseases increases with age, it is important for your loved one to be proactive. If your loved one eats beans frequently, he or she can reduce the number of colorectal polyps, which can decrease the risk of this type of cancer. Both the Nurses’ Health Study and the Shanghai Women’s Health Study followed large groups of women, tracking their consumption of different types of beans. These studies found those who ate more beans were less likely to develop type 2 diabetes. Soybeans and peanuts, which are considered legumes despite their name, were both found to be especially beneficial. Beans are a cheap form of high-quality protein. In addition to having less fat than other protein forms like red meat, beans are perfect for a senior living on a fixed income. Though your loved one can purchase cans of beans, dried beans are the most economical option, and they are not very difficult to prepare. If your loved one needs help preparing the beans, consider hiring a Harrisburg, PA, home caregiver to assist with cooking. Rather than having the same type of beans day after day, there are many different ways to prepare beans for your loved one. Chickpeas can be blended into hummus or white beans blended into other dips. Additionally, beans can be added to soups, pastas, and rice dishes, or you could simply add a few spices and serve beans as a side dish. To learn more about senior nutrition, reach out to the elderly in-home care experts at Home Care Assistance. Our experienced caregivers can assist with meal prep, go grocery shopping, and help with a wide variety of other important tasks. In addition to our respite and 24-hour care services, we also offer specialized Alzheimer’s, Parkinson’s, and stroke home care Harrisburg, PA, seniors can rely on. For more information and to schedule a no-obligation consultation, call a knowledgeable Care Manager today at (717) 540-4663.